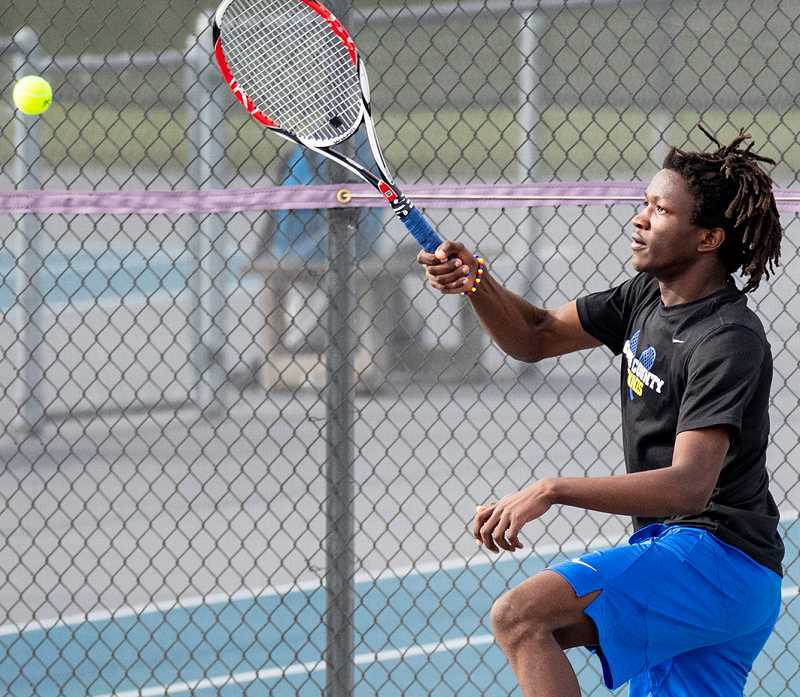 The Crook County Cowboys swept the first three singles matches but were unable to win any other matches as they fell 5-3 to Ridgeview in the opening Intermountain Conference tennis match for both teams. Pablo Casado made quick work of Ridgeview's Ethan Hicks in their No. 1 singles match, taking a 6-0, 6-1 victory. Casado used the second set to work on his serving as he dominated the match. Playing No. 2 singles, Moses Freauff also dominated his match, taking a 6-2, 6-0 victory over Walter Gates. Jordan Owens won the final match for the Cowboys as he edged Josh Papen 6-3, 6-4 at No. 3 singles. In the final singles match of the day, Ridgeview's Colby Carson rolled past Crook County's Kevin Chu 6-0, 6-0. The Ravens then dominated doubles play, as Aiden Poindexter and Shad Bangarter rolled past Jeremy McCullough and Nick Cushman 62- 6-3, and August Johnson and Aidan Marsters defeated Ty Cross and Yuya Yamaguchi 6-3, 5-6, 10-5 in No. 2 doubles action. The shorthanded Cowboys then forfeited the remaining two doubles matches to the Ravens. The Cowboys were back in action on Saturday at the Madras Invitational, where once again the Cowboys did well in singles action. In the format at Madras, the teams' No. 1 singles players played a round robin format in the eight team tournament. No. 2 singles, No. 1 doubles and No. 2 doubles also played a round robin format. Complete results for the tournament were not available at press time. However, both Casado and Freauff finished the tournament with 6-1 records, while the only wins from Crook County's doubles teams came when Klamath Union left the event early and forfeited their final matches. The Cowboys are back in action Wednesday, when they host The Dalles in a 4 p.m. match.